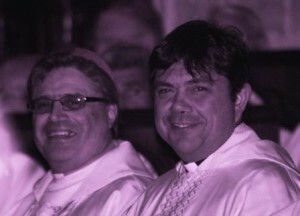 Bishop Joe Grech and Fr Maurizio Pettena concelebrating Mass with Bishops and Priests in Sydney, May, 2010. Bishop Joe is still very much a holy presence in my life. I remember very vividly last year on the 23rd of December when he called me at about 10pm at night and asked me what I was doing. He said he wasn’t feeling too well. He kept feeling worse, and the doctor recommended that he be hospitalised. On Christmas Eve, he was. He rang me as he was being admitted to the hospital and asked me if I could come and be with him. A few hours later, I was there in Melbourne at St Vincent’s private hospital where I found him in his usual joking mood. The doctor came in, amused by the jovial character and positive in his outlook. “The Bishop needs a blood transfusion, some rest, and he will be as good as new”, he informed us. It was after 10 at night when I left the hospital. That night, I concelebrated midnight mass at St Brigid’s in North Fitzroy and we prayed for Bishop Joe. I went back to the hospital on Christmas day. He had changed. He was restless, and he kept on holding tight to my arms. He was looking for his Episcopal ring, he wanted to make sure that it wouldn’t get lost. By early afternoon, he had been admitted to Intensive care. Though he seemed to be talking in circles, a little delirious, there was lucidity in his words. He kept on reminding me of certain issues pertaining to the pastoral care of migrants and refugees. A few days before, we had gone out with a media statement on the tragedy of the boat which had crashed into the rocks of Christmas Island. Soon, he lost consciousness, never to regain it. A specialist came in at 6pm and said that Bishop Joe might not make it through the night. I remember that when he said that, I felt a shiver in my body. I could hear the echo of his last words to me, to trust in God and take one day at a time. As soon as it was possible, together with two other priests, we administered to him the anointing of the sick and we stayed there praying until the early hours of the morning. Bishop Joe was the only patient in intensive care. There was a sacred silence around. I felt an enormous loneliness. This man who had been able to capture something of the depth of the heart of Christ was dying now during the Christmas season, while everyone is taking a break, taking some time off. The loneliness of the moment was overwhelming. All the Bishops of Australia were soon informed of Bishop Joe’s illness together with the Apostolic Nuncio. They made themselves constantly present through phone calls and visits. The news spread very quickly within the community. Very few people were admitted to the intensive care where he was, yet there was a constant line at the doors of St Vincent’s. This Bishop had touched the lives of so many people. He had taught them to believe, to hope, to love and to pray. And now, they were coming back to him with their faith, with their hope, with their love and with their prayers. Bishop Joe died at 3pm sharp on the 28th of December, 2010 – the feast of the Holy Innocents. He was in love with Christ and with the Church. I was blessed with the gift of witnessing that love. He had not had an easy life, but his love for Christ and the Church was something he had the grace to communicate to others as well. Wherever he was, whenever we had a chance to celebrate Mass just the two of us, at the Offertory, he would always pray for the Diocese of Sandhurst, for the priests, and for migrants. Sometimes I drive to Bendigo, I sit in the Cathedral, and I read through the pages of the visitor’s book, which is kept in front of his picture. I am constantly enlightened by the outpouring of gratitude that the people express to him in the many graces they keep on receiving through his intercession. The sentence “God does not make rubbish” was one of his great sayings. It showed his great faith in human beings and their belief in the presence of God. It speaks of the incarnation of God that enters into the cavernous depths of the human heart. “When somebody asks you to pray for them, don’t just say yes – do it immediately”, he would say to me. “It doesn’t matter if it is over the telephone, through an email, or in their presence – just do it – Because this is why you are a priest – to pray for your people”, he would say. And these were also among his last words to me. “Pray for me”. This entry was posted in Uncategorized and tagged Asylum seekers, Bishop Joe Grech, catholic bishops, Chaplains, Christ, Church, Fr Maurizio Pettena, Jesus Christ, Pastoral, refugees, The Body of Christ on December 22, 2011 by Mark Wei. Bishop Joe was a dynamo! I recall at WYD in Sydney he spoke at Receive the Power Live to 100,000 youth! He captured Christ & evangelised many! He is a face book friend & I will never felete him. God bless! !